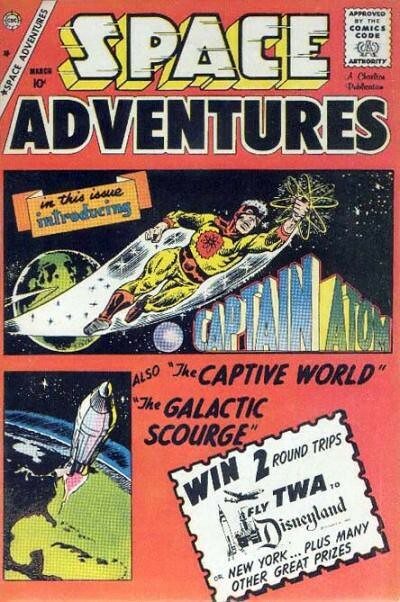 The DC Comics character we know of today as Captain Atom first appeared in Charlton Comics’ Space Adventures #33. Cover-dated March 1960, this issue was most likely on sale in January of 1960. Captain Atom was created by Steve Ditko and Joe Gill. After a major overhaul of the character in Charlton Comics’ Captain Atom #84 (in January 1967), the character languished a bit. When Charlton Comics stopped publishing super-hero stories, the character (along with many others) was purchased by DC Comics. The Captain made his first official appearance in DC Comics in Who’s Who: The Definitive Directory of the DC Universe Volume IV, but it wasn’t until three months later (in Crisis on Infinite Earths #6) that he saw any action. That paved the way to his own new series that ran from 1987 to 1991. 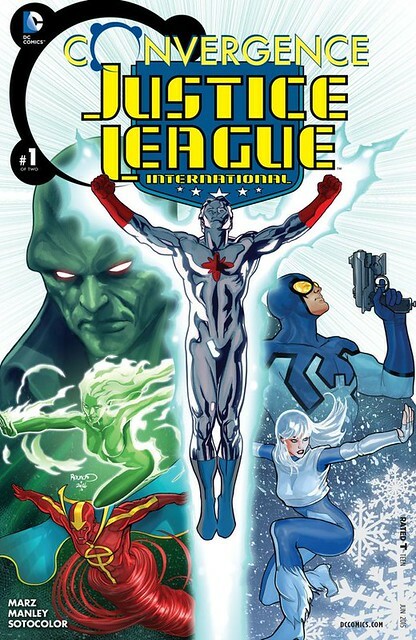 A member of the Justice League, Captain Atom remained in the background of the DC Universe after his series was cancelled. He saw a short-lived return as part of DC’s “New 52” in 2011, where the character was once again revamped. Sadly, the new series was cancelled after 13 issues. As of this writing (5/17/2015), Captain Atom’s fate is unknown. The New 52 Captain Atom was last seen in the Futures End series in November 2014. The Bronze Age and Modern Age Captain Atoms were both seen in the Convergence series in June/July 2015. The first comic I ever bought was a Marvel title. It was Doctor Who #8 (1985). I picked it up because a friend who was really into Dr. Who loaned me some of his comics and I wanted some for myself. But I did not consider myself a comic book guy. Yet. Another friend of mine, a life-long fan of Firestorm and comic book geek (Roy) took me comic shopping with him one day in the Winter of 1987. In those days, comic shopping was going to the local Quick Stop and seeing what they had on the spinner rack. I picked up Hex #18 (DC) and was intrigued. I couldn’t follow the story because I couldn’t tell what Keith Giffen’s art was supposed to represent (I was 15 and naive and did not appreciate it for what it was). But I was intrigued by this man Jonah Hex, a cowboy transported to a post-apocalyptic future. Sadly, it was the last issue. So next time I went shopping with Roy I got The Green Lantern Corps #210. Here was when I became a full-on Comic Nerd. Green Lantern was the most awesome thing I had ever seen. He was a space cop, made out with cute alien girls, hung around with weird looking other space cops, and had a magic ring that could construct anything he could imagine. As I’ve gotten older and my tastes have changed, I have never lost my love of the Green Lantern. 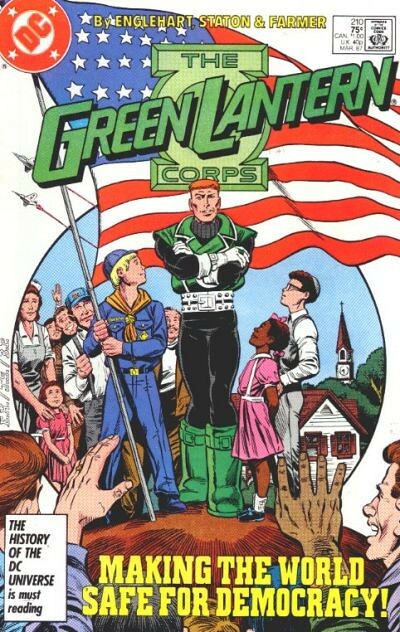 But around the same time I became aware of Green Lantern, I discovered another wonderful hero. He was Captain Atom. I knew none of the history behind the character, that he had been created by Steve Ditko in the 1960s (I was a novice, I didn’t know who the hell Ditko was). I didn’t know he had been on the fringe of the DC universe since he was purchased from Charlton Comics. 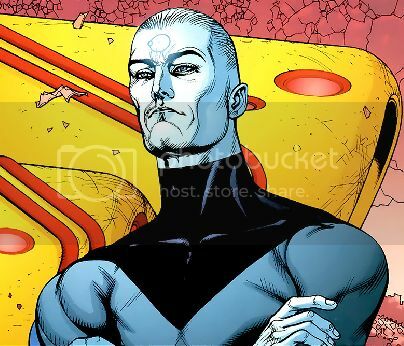 I didn’t know he was the inspiration for Dr. Manhattan in this new Watchmen book I kept seeing ads for. I just knew he incorporated one of my most favorite sci-fi devices: time travel. Plus his skin was indestructible metal and he could shoot energy blasts out of his hands! I was hooked from issue one. And hooked on the character of Captain Atom for life. In retrospect, the 1987-1991 Captain Atom series was not always DC’s finest work. More than one plot thread was left dangling throughout the series’ life. The science was a bit hacky and the character really didn’t grow much. But I was fifteen years old when it hit me and I loved every issue. Also, the more I delved into the history of the character, the more awesome things I learned that I was completely unaware of. And that is the reason for this blog. It is my goal to read every appearance of Captain Atom from 1960 to today and review each and every comic. I imagine at times it will be difficult (some of these old Silver Age books are hard to come by). It may be a bit costly. But dammit, I have to have a goal. I need to have a purpose. And I need to open the eyes of the public to how freaking awesome this character was and could have been. So I will go, issue by issue, atom by atom (if you’ll pardon the pun), over all the Captain Atom goodness I can find. I hope that at the end, you will have the same appreciation for Captain Atom that I do. Hi! Just wanted to say that your blog is great! I just started a Captain Atom on Facebook a couple months ago. We still have only about 100 members but Pat Broderick, Romeo Tanghal, Aaron Lopresti and others have joined! I shared a link to your blog with the group so hopefully, they will find their way here. Thanks again for the great blog!